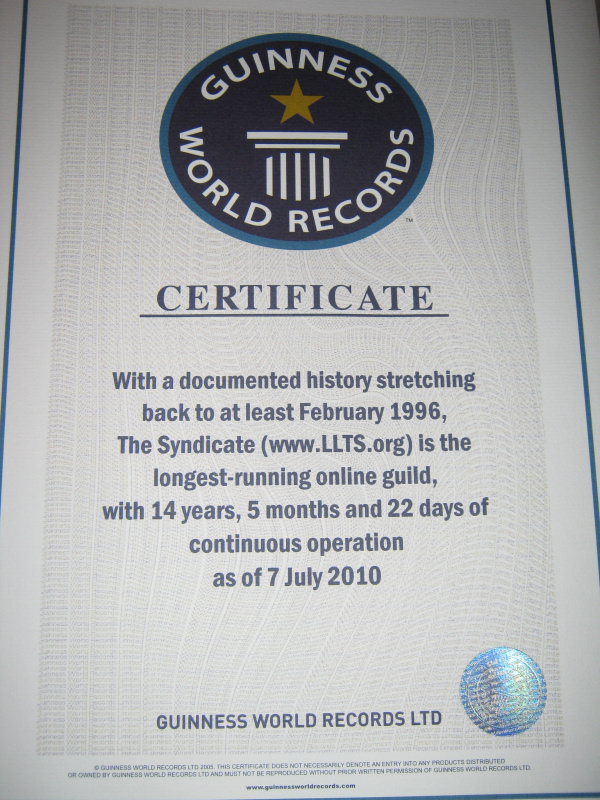 Guinness World Records™ has awarded The Syndicate the World Record with the following definition: With a documented history stretching back to at least February 1996, The Syndicate (www.LLTS.org) is the longest-running online guild, with 14 years, 5 months and 22 days of continuous operation as of 7 July 2010. The key part to this record is "continuous operation." There were certainly guilds from before The Syndicate was founded but we can provide independent sources of data documenting our founding date and our continuous operation for our entire history. That verifiable proof and continuous operation allowed us to attempt and earn the record. To hold a Guinness World Record is no simple matter. First... you have to determine if you can even apply for one. There are all sorts of rules about what does and does not qualify as a record attempt. Second... you have to apply to be considered. At that stage you are evaluated on if your claim meets the criteria to be reviewed. Third... if you pass that stage then you have to prove your claim. In our case, we filed ourselves as the Oldest, Continuously Operating Online Gaming Community. Saying we are that... and having a website that says that... means pretty much nothing in terms of the in depth process Guinness uses to determine if you hold a record. You have to provide verifiable proof, from 3rd parties, that they can review, authenticate and make a ruling on. So The Syndicate achieving this feat is a big deal. Of course, by the time you read this page we are older than the record even states. To achieve it we had to be old (which in an medium where guilds implode by the second is far from an easy feat) and we have to be able to provide proof (not just our claim) that is verifiable and from multiple, different, independent sources. So Congrats Syndicate on another milestone!